When it comes to forklifts and max weight capacities, there’s a big difference between myth and reality. 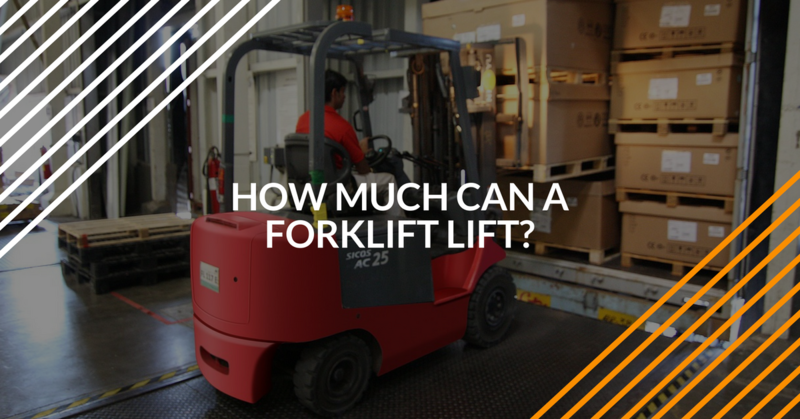 How much can a forklift lift? Myth: every warehouse forklift can lift much more than they’re designed for. Reality: it’s always a good idea to check your forklift’s manual for its max load requirement. Despite their superhuman strength, durability, and reliability, even forklifts are limited in the amount of weight they can lift. Too often, forklift operators think their lifts can handle a certain amount of weight, only to find out the hard way they can’t! That’s the difference between guessing how much load a particular forklift can lift and knowing for sure. The U.S. Occupational Safety & Health Administration (OSHA) has guidelines in place to help forklift operators, pallet jack drivers, and other industrial powered truck workers be aware of their machine’s ability to lift, maneuver, and store cargo. In fact, OSHA’s Powered Industrial Trucks eTool resource reviews some interesting max load capacities for common forklifts. In their given example, OSHA explains that a forklift able to lift 4,000 pounds at a 24-inch load center can only carry 2,666 pounds at a 36-inch load center. Think about it: just a one-foot difference in the center load position and a forklift’s max load is reduced by up to 33%! Which brings us to another myth/reality issue. Myth: if a forklift can lift 3,000 pounds off the ground, it can move anywhere safety with 3,000 pounds. Reality: the higher a heavy load is lifted, the less safe a forklift becomes. Due to ineffective (or nonexistent) training, many forklift drivers aren’t aware of max load capacities, or how to safely navigate their workspace with a heavy load. ForkliftCertification.com, the leader in online OSHA training, provides the knowledge and skills to help anyone – including you – better understand how forklifts handle heavy cargo. Still, many of our customers would like to know how much a forklift can lift. Let’s find the answer! The answers are as different as the kinds of machines involved. Pallet jacks – also called order pickers, typical pallet jacks can lift approximately 3,300 pounds. 3-wheel lifts – used for pallet storage and other “minor” tasks, this type of lift has a max load capacity of about 4,800 pounds. 4-wheel lifts – one extra wheel, much more weight. While 3-wheel lifts can move around 4,800 pounds, 4-wheel lifts are capable of carrying nearly 8,000 pounds! Counterbalance forklifts – this is one of the most common types of forklifts, and can hoist up to 5,500 pounds. Rough terrain forklifts – designed for heavy-duty work on all types of terrain, these lifts are built for ultra-impressive max load capacities. In fact, rough terrain forklifts can handle up to 35,000 pounds! Experienced forklift drivers are required to know different forklift maximum load requirements because they might use more than one type of lift every week – or even every day – on the job. Beginning forklift operators also need to know how much their forklifts can lift. Bottom line: when it comes to safety with forklift load capacity, you can learn how much weight a forklift can lift by taking an OSHA-compliant certification course. Contact Us Today – We’ll Handle the Heavy Lifting for Your Company’s OSHA Training Requirements! While your forklift can’t lift everything, FLC’s OSHA experts are more than happy to do the “heavy lifting” for your firm’s forklift training requirements. We’re a premier provider of convenient, budget-friendly, online OSHA training for small companies, large corporations, and even individual forklift drivers just like you! FLC offers the following three training packages. All of our courses cover crucial OSHA safety concepts, including max load capacities for forklifts. Training Kit – this comprehensive training session gives you all the skills, knowledge, and OSHA guidelines to become a better forklift driver…today! Train a Trainer – for anyone looking to become an on-site safety resource and OSHA liaison, our Train a Trainer package goes over everything necessary to take your safety know-how to the next level. Bundle Package – this value-added training course from FLC includes both the Training Kit and Train a Trainer training sessions. Ideal for both employers and employees who want to become OSHA certified today, from both safety supervisor and forklift operator perspectives. From how much your forklift can lift to proper maintenance guidelines and more, no other OSHA forklift training company instructs you better than FLC! With our complete coursework, streamlined learning method, and real-world applications to help you retain critical OSHA safety content, we’re ready to help today! For more information about our forklift training packages, give our OSHA experts a call today at (888) 278-8896.